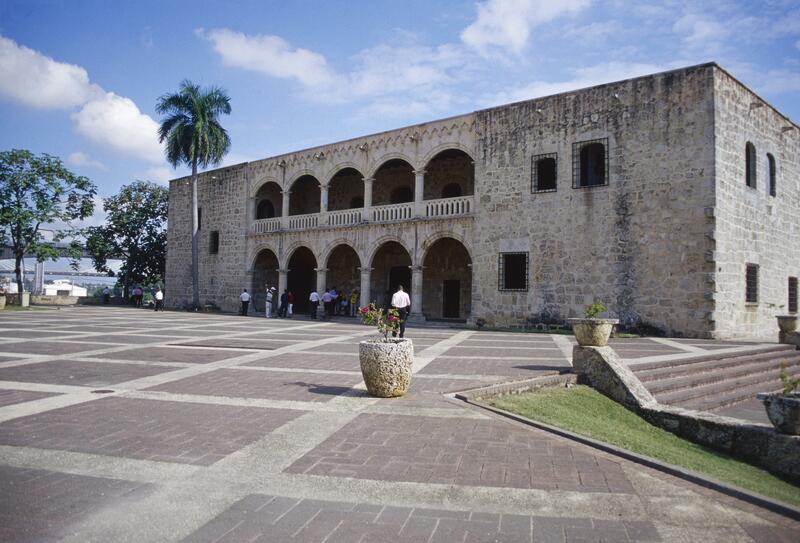 This Spanish-style palace, one of the earliest in the New World, was built for Christopher Columbus’s son Diego. In combining aspects of an elegant Spanish palace with elements of a fortress, it seems to emphasize the Columbus family’s political and military ambitions. The flat roof of the building, while appropriate for arid Spain, is less so in Santo Domingo’s wetter tropical environment. The stones are set in slightly irregular courses, with spaces in between filled with mortar. The double arcade of the façade is drawn from European Renaissance models. In New Spain, similar facades were used for buildings housing the municipal government. The building underwent extensive restoration in 1957, and is now open to tourism. As governor, captain-general and viceroy, Christopher Columbus aspired to control Spanish conquests in the New World, taking a tenth of all revenues due to the crown. When he proved an incompetent administrator, Spanish rulers removed him from control. But his son Diego was allowed to rule in the Caribbean, and his tenth of royal revenues in the region made him a very wealthy man. This house was begun after Diego’s return to the island in July of 1509 as its governor, when he was accompanied by his high-born Spanish wife and other relatives. The building is made of cut stone, set with mortar, a simple but labor intensive technique. The flat roof was spanned by wooden beams. 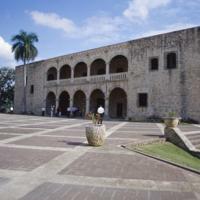 Indigenous people and African slaves were the primary laborers in Santo Domingo at the time the Alcázar was built, as most Spanish immigrants were soldiers, sailors and adventurers. Like other colonists, Diego Columbus drew on Spanish architectural models when building his New World home. But his plans were carried out by the available labor force: native Taínos and African slaves. His builders made use of local materials—wood and stone—but used an architectural vocabulary imported from Spain.